In an apparent David vs. Goliath matchup in the World Cup on Saturday, David won, again! Well, almost. This time David tied, which was quite a feat when Goliath was the mighty German football machine. Despite what German “expert” Andrei S. Markowitz says in this fantastic series of New York Time articles about what soccer means to different nations’ identities, the Germans play all around solid, efficient, mechanical football, rarely shocking spectators with their spontaneous flair but always performing at a high level. In other words, the Germans are boring to watch, but they win, and to an American, they might even be one of the most exciting teams in the tournament, because their class yields goals even if it fails to dazzle. And with Ghana’s opening game loss to the hard-fighting but, yes, it must be admitted, class-lacking Yanks, the Black Stars perhaps appeared to be easy prey for the German Eagle . This metaphor references the nickname of the German team, “Das Adler,”–The Eagle. For context, during the U.S.-Ghana match while Ghana was relentlessly attacking the American goal, I texted my father: “It feels like a National Geographic piece where the cheetahs are stalking a group of baby wildebeests.” To be clear, the Ghanaian players were the cheetahs and the U.S. players were the baby wildebeests in my despairing mind. But anyone who watches a lot of Nat Geo knows that sometimes the prey gets away and survives. Sometimes David beats Goliath, and John Brooks’ header in the 86th minute rocketed Graham Zusi’s corner kick–much like a pebble from a sling shot–right past the defense and into the forehead of the Ghanaian goal, killing the cheetah and giving hope to underdogs, baby wildebeests, and delusional American soccer enthusiasts like myself, everywhere. 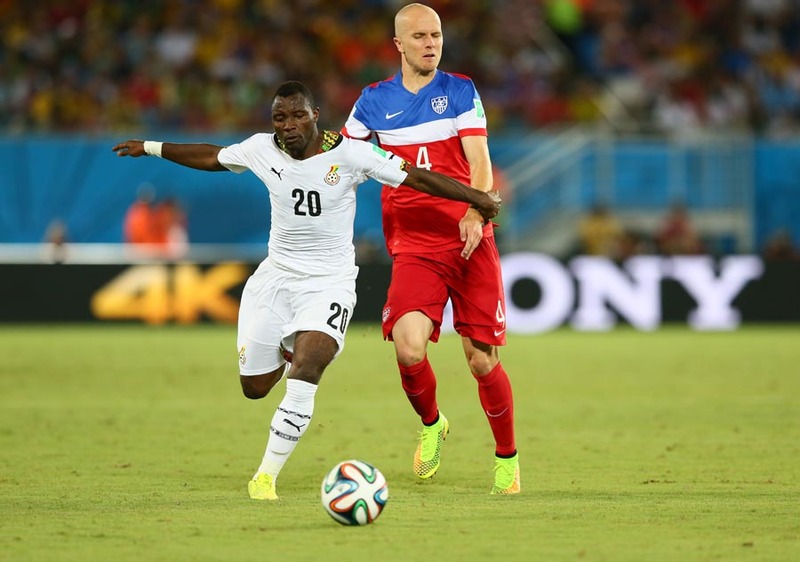 Ghana defensive midfielder Kwadwo Asamoah dribbling past U.S. attacking midfielder Michael Bradley. But going into the Ghana-Germany match, it was easy to forget that Ghana dominated in their loss to the U.S. Anyone watching could tell that Ghana was the better team with loads more skill and class than the injured and timid U.S. side. Asamoah Gyan said so himself in interviews before and after the match, and he was right. The link-up passing between the Ayew’s and Sulley Muntari in the middle, Gyan up top, and Kwadwo Asamoah coming up the left flank from the back was impossible for the U.S. to handle. The Ghanaians just couldn’t come up with a finish until André Ayew scored on a beautiful play that started with Asamoah dribbling to the middle and firing a sharp pass to Gyan who then hit Ayew in stride as he was running to the goal. One perfect touch and an impressive shot with the outside of his right boot, and the game was tied. A moment of brilliance to match Clint Dempsey’s opening minute magic. But unlike the U.S., Ghana had such moments (without the finish) throughout the entire game, every minute. They had 21 shots to 8 from the U.S. Only 8 of Ghana’s shots were actually on goal, which was a major problem for them, but they were able to dribble and pass around the U.S. team at will before reaching the final fourth of the field. One key stat for this game and for Ghana’s second match against Germany was possession. In a tough loss to the U.S., Ghana had 60% possession. In a thrilling 2-2 tie with Germany, their stat line reversed, in large part due to Germany’s class, and Ghana only had 40% to Germany’s 60% of possession. So what was different about the Ghanaians play, and in general, what does a team do in a match where they have little possession? Well, the U.S. sits back, makes a wall around the goal, and prays that Tim Howard comes up huge, while their fans wince and recall repressed childhood memories of hunted baby wildebeests. But most teams, squads overflowing with skill and class and pace, counterattack at every opportunity and turn opponents overreaching advances into scoring opportunities and goals. That is exactly what Ghana did Saturday to the unsuspecting Germans, and the machine didn’t know how to respond. An eagle only thinks of itself as predator and knows not what to do when its prey counterattacks up the wings with three players running down two defenders. The Eagle becomes defenseless. Ghana midfielder André Ayew celebrating his goal against the U.S. He celebrated even more ecstatically after scoring against the Germans. On Saturday, the Black Stars of Ghana did to the Germans what the Stars and Stripes of the U.S. could not due to them—they made the Germans pay for holding onto the ball and passing it around, a kind of shaming of the wealthy by opportunistic and quietly talented poor, in possession that is. In pure talent, ball skill, passing, and finishing the Ghanaians are one of the richest teams in the tournament, not so much a David as a lesser-known, under-appreciated Goliath. This game plan and identity has featured prominently in this World Cup not only from Ghana but from teams like Colombia, Chile, and Costa Rica, all of whom have already advanced to the second round. These teams, Ghana included, are strong and cause us to ponder: Was David actually a Goliath all along? We’ll let that pointless biblical question hang and get back to Ghana’s performance and what it means for the U.S. team going forward. In the 51st minute, Mario Goëtze kneed in Germany’s first score, a mechanically produced goal, squeezed out of a methodical attack featuring Thomas Müller crossing the ball from the right wing onto the head of the streaking Goëtze, in the box. The Germans had already been dominating possession by this point in the match, and it seemed that their first goal might be one of many. But Ghana responded 3 minutes later when André Ayew, who scored against the U.S., beautifully headed a cross from a free kick past diving German keeper Manuel Neuer. What Ayew did next may have been just as important as his goal. For the next few minutes of game time, Ayew seemed to be in an impassioned rage or energetic trance, trying to pump up his teammates as if to say: “Guys, this is our game. We scored and then conceded last time. Let’s not [expletive] do it again! Let’s get another.” And 9 minutes later, heady midfielder Muntari stepped in front of a lazy German pass and darted a perfect, slippery ball ahead to prolific forward Gyan who took a touch and scored expertly, answering Ayew’s call. Luckily for the Germans, their prolific striker Mirsolav Klose answered Gyan 9 minutes after that to round out the scoring, but Ghana’s point had been made. They didn’t need possession. They came to play counterattacking soccer, and they took their chances. 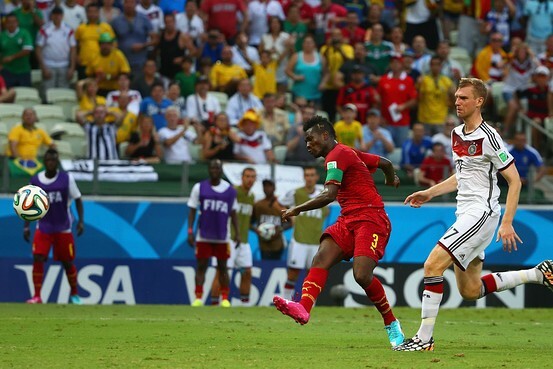 Ghana forward Asamoah Gyan scoring against Germany. It wasn’t just that they scored goals, but they created chances and vast openings on the wings that caused the Germans headaches and gave neutral fans as well as their own something to cheer about every couple of minutes. The German’s efficient attack, while efficient, didn’t elicit the ooohs and ahs of the Ghanaians, at least not in the midtown New York City Irish pub where I watched the match. Thanks to the 4 goals, the excitement from the Ghanaians, Muntari’s sagging pant problems, and the weighty implications riding on the game for both teams, the second half of this match was easily the best half of football so far in this World Cup. Even the last few minutes proved dramatic, as Ghanaian defender Jonathan Mensah had to dangerously slide tackle Müller in the box to prevent an open shot on goal. The block is a sure candidate for defensive play of the tournament so far along with Mexican keeper Guillermo Ochoa’s save of a Neymar header and England defender Phil Jagielka’s goal line clearance of a Mario Balotelli floating shot. The last German corner kick resulted in a Ghana break away, which didn’t end in a game-winning goal but did put an exclamation point on an incredible performance without possession but with the edge in the match. And the edge is exactly what the U.S. will look to grab hold of in matches against more talented, more experienced, and deeper Portugese and German sides. This match was not what the U.S. wanted in terms of Group G standings. The tie keeps Ghana in the mix of teams contending for a spot in the Round of Sixteen. However, U.S. coach Jurgen Klinsmann must use the information extractable form the Ghana-Germany tie in preparation for the team’s next two pivotal matches. It’s a matter of life or death now. Can we capitalize on the counterattack like Ghana, like David? Or will we be eaten alive by the German Eagle and his flashier Portuguese cousin? Either way, we can appreciate the intensity of the latest Cup games and the perseverance and grit of Ghana—we already beat them after all. Group G is wide open, and every team can still qualify. Who is going to grab the edge?